There was a time when "Pong" was a must-play breakthrough bit of futuristic technology with people waiting in line to give it a try, but now nobody would invest a quarter to play it in an arcade. Similarly, believe it or not, people were mesmerized when listening to the series of "beeps" coming from Sputnik I satellite during its short life circling the Earth. 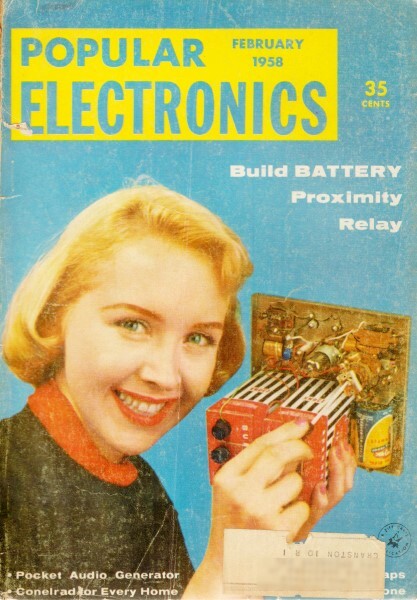 This item from a 1958 edition of Popular Electronics shows high school students listening intently to a tape of Sputnik's broadcast. The same "Electronic News" page reported on the availability of a special record with calibrated sounds for helping to calibrate and troubleshoot hi-fi systems, and also a new low-wattage public address speaker system installed at Yankee Stadium that needed only 6½ watts per speaker. Another recording star has zoomed into the world's firmament. While it's not expected to out-gross Elvis, Sputnik's signals have proved to be quite an attraction to a Mason City. Iowa, high school, as seen in the photo above. 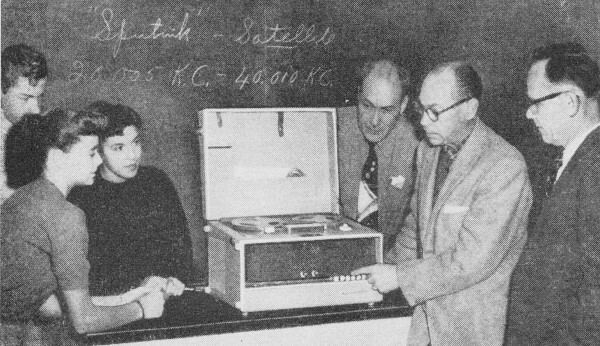 Two local high school teachers, in cooperation with a Bell & Howell tape recorder dealer, recorded the "beeps" of Sputnik I. Then, using a radio announcer as commentator, they incorporated all pertinent scientific data to produce an educational tape on one of the milestones of scientific achievement - including the "interview" with Sputnik itself. The tape has been made available to schools and colleges and other interested groups, and has been playing to capacity audiences at all sessions. A series of test records to help the audiophile determine what's wrong - if anything - with his hi-fi system has been issued by Components Corp., Denville, N. J. Priced at 89 cents each, the records consist of tests and instructions in layman's language on the following problems: wow and flutter; stylus wear; rumble; pickup resonance; vertical/lateral response; and location and cure of hum. An unusual high-quality public address system brought cathedral-like sound to 50,000 people attending a religious service at Yankee Stadium recently. Backbone of the system was an installation of 12 University WLC speakers in a square atop a special canopy 48 feet above the altar on the field at second base. Although capable of handling 30 watts each, the 12 speakers required a total of only 6 1/2 watts to achieve complete sound coverage. Such a low-level sound installation is just the reverse of earlier systems at the Stadium, which used large amounts of power fed into a relatively small number of speakers. This had a tendency to cause echo effects, blasting and reverberations not present with the University system.